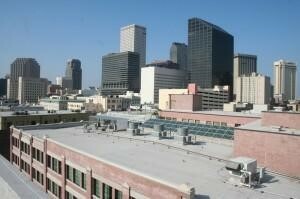 Your commercial roof is one of the most important investments that your business has made. It might not be the most glamorous investment, sure, but your commercial roof is the only thing that stands between your business and the elements. For this reason, it’s important that your commercial roof be regularly evaluated for leaks and signs of damage. If any of these things are uncovered, then it’s important that they be properly addressed. A commercial roof that’s regularly maintained can offer decades of service, while one that’s not is merely a costly roof replacement waiting to happen. The first place you should look if you’re evaluating your roof for leaks is inside. To perform this evaluation, you merely need to conduct a visual inspection of your walls and ceiling. You’ll want to look for leaks themselves, as well as for damp spots or places where watermarks are apparent. If your business has drop ceilings, then it may be necessary to remove the tiles in order to conduct a visual examination. If you notice any such problem areas, then make a note of where they are so that you can direct your attention to these locations on top of the roof itself. When conducting an indoor inspection, though, it’s important to remember that where the leak appears to be on the inside may not actually correspond to where it is on the outside. This is due to the slope of the roof, as well as internal structural elements that water can travel along before it actually leaks through the ceiling. Once you’ve conducted an indoor visual inspection, it’s time to examine the roof itself. Depending upon what roofing system your business has employed, what you will need to look for will be different. If, for example, you have an asphalt-based roofing solution, you will want to inspect your commercial roof for signs of cracks and wear. On the other hand, if your commercial roof is membrane based – like an EPDM roof, for example – then you’ll want to examine your roof for place where that membrane has worn down, been torn, or is pulled up. While you’re conducting this examination, be sure to inspect drains as well, as clogged drains lead to pooling water, which causes serious problems. In addition to examining the roof material itself, you’ll also want to consider other things as well. More than likely, your commercial roof contains HVAC units, vents and skylights. Thoroughly inspect these areas for places where water might be getting through. In addition, you’ll want to examine the roof’s flashing. While these strips of metal may not seem like much, they prevent water from getting into your building at places where your roofing system runs up against other structural elements. These are particularly important to inspect, because leaks that form at these junctures may not be readily apparent inside the building, and such leaks if left unaddressed can seriously degrade the structural integrity of the building. Depending upon the severity of the leaks that you’ve found and the complexity of the problems you’ve uncovered, you might be able to address the problem yourself. For example, if a leak appears to be coming through an insufficiently sealed skylight, then caulking it might do the trick. However, most commercial roof leaks require the assistance of professionals. So, in order to protect the investment you’ve made in your roof, get in touch with a licensed roofing contractor that you trust. More than simply repairing the problems that you’ve identified, this contractor will be able to identify and address other problem areas, thereby increasing the lifespan of your commercial roof and saving you from the expense of a costly roof replacement.